Those are King chess pieces in variety sizes. We provide those sizes, from 8 inch to 72 inch. Made of Teak wood and very durable for outdoor also indoor decoration furniture. Carved by expert craftsman and polished in brown or natural wood color. Perfect for your house, hotel decoration, school, and other public space. Besides, it also use for chess festival and outdoor game. It make the player more exciting in outdoor game using the big chess one. 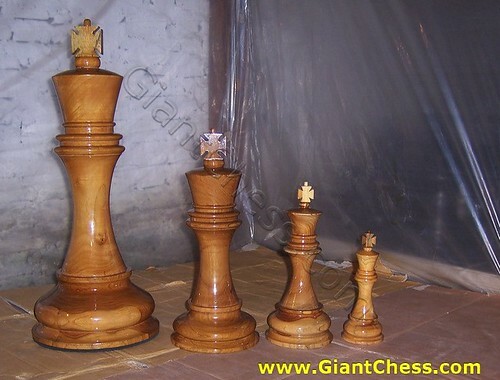 Beside used as decoration furniture, this chess pieces also suitable for gift. May be you feel confuse about some gift in special event for one of your family, friend, or someone special. Try to give something different than other. Try to give big chess pieces to them. Sure that they feel surprised and never forget. Get this chess pieces right now!